Titus and I had another trip to the hairdresser today. Each time we go I have to ask our friend Mel to make the appointment for us since we don’t speak Czech, and our appointment today was at 9:30am. We got there on time and I told Titus I would go first. I kind of feel that when he watches me get a haircut before him it gives me a little more confidence. Earlier this week when I told Titus we would be going, he said to me, “Will you hold my hand?” There’s still a little fear there for sure. But Titus did great! He stayed pretty still throughout his hair cut and I kept telling him he was getting his cut like daddy’s. Zuska kept talking to him in Czech and it was to watch Titus just smile. Below are two photos Bethany took of him today. He’s getting so big. 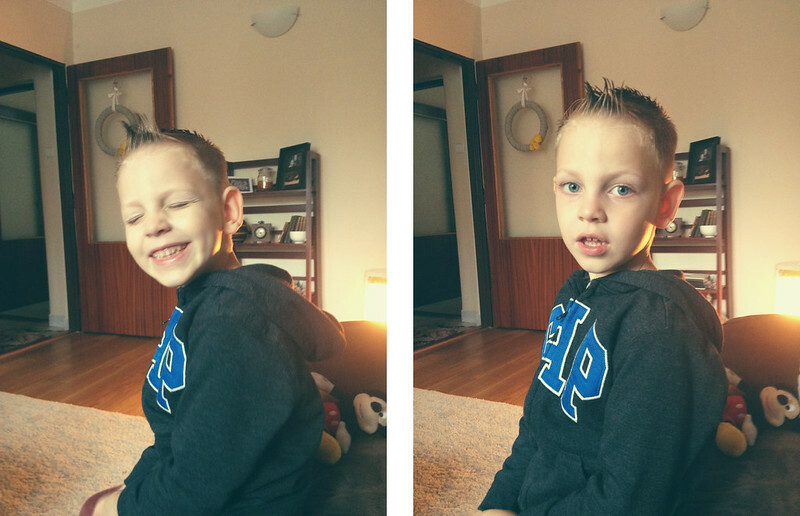 The photo on the right is actually really accurate to how Titus was feeling today. He’s been kind of stuffed up for the last few days, but he definitely had a cough and was really stuffy today. Of course Avery is right behind him with lots of sneezes so I think we’re going to have a bit of a sick family for a few days here. As I often do on Fridays, I worked from home today. Right now I’m working on getting our team in the States some materials for their upcoming recruiting tour. We have a few of our staff people who will be visiting various Christian colleges around the U.S. recruiting interns for next summer. I’m helping get them materials to pass out and hopefully aid them in getting more students to spend their summer over here serving the Lord. We watched a little moving tonight as a family since aren’t feeling well. I made popcorn on the stove but had to run to the store for some canola oil. Never in my life have I see so many bottles of oil at a grocery store (regrettably, I didn’t get a photo). I don’t know exactly what they’re using it all for but you get that stuff basically by the drums! The popcorn turned out alright, but it wasn’t my best batch. The kids really enjoyed it and that usually makes it worth the effort. The Dodgers are playing their first postseason game tonight and I really do wish I was in the States to watch it with friends. I’m not sure if we’ll be able to watch it over here or not, but we’re root, root, rooting for the Dodgers all the way from Czech!